This article comes to us courtesy of the Geauga County MapleLeaf. Our thanks to the MapleLeaf for permission to republish the article here. The visiting judge who issued a strong rebuke of Geauga County Probate Court Judge Tim Grendell’s actions against two Chester Township trustees now has accused his top administrator of improper communication. 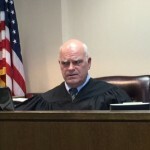 He also urged Grendell to recuse himself entirely from the case, stating Geauga County and Grendell could be personally liable if two September 2016 orders Grendell issued are found to be void. Retired Medina County Probate Court Judge John J. Lohn said Kim Laurie, Grendell’s budget/fiscal director and county liaison, initiated two improper communications with him after he had issued a Feb. 2 order completing his assignment in the Chester Township Park District case. He advised the parties of Laurie’s improper communication in an eight-page notice, which was filed in the probate court on Feb. 14. The Geauga County Maple Leaf learned on Feb. 15 that counsel for the township had seen the filing on the docket on Tuesday. However, when counsel attempted to obtain a copy of Lohn’s notice, a probate court clerk advised the notice was not being accepted for filing. A review of the docket on Wednesday did not reflect the notice had been filed. The Maple Leaf emailed Grendell and Laurie about Lohn’s notice and asked them a number of questions, including who removed it from the docket, who made that decision and why. On Wednesday afternoon, Lohn’s notice was re-filed and later reappeared on the court’s docket. “A determination needed to be made whether to file and docket it as a notice or as an order, or to simply receive the document, as there are different procedures for each,” she said. After a review of the documents on Feb. 15, “the court administrator directed the documents were to be accepted and docketed as a notice of filing,” said Laurie, adding a determination also needed to be made whether Lohn “possessed the authority to file an order at all” because, by his own admission, he had completed his limited assignment as of Feb. 2. In his Feb. 15 notice, which has the original time-stamp X-ed out, Lohn advised Laurie had called him on Feb. 7 to inform him the court had received an invoice — for $7,025 — from Master Commissioner Mary Jane Trapp. Trapp, whom Grendell appointed in 2014 as a master commissioner in the case, had been instructed in September 2016 to conduct a civil and criminal investigation into whether trustees Ken Radtke and Mike Petruziello broke the law in voting not to enter into a new agreement for the management of the township-owned Parkside Park. Ohio Supreme Court Chief Justice Maureen O’Conner had assigned Lohn to review Trapp’s report and to conduct future hearings, if any, related to her findings after Radtke requested that Grendell be disqualified. Instead, on Feb. 9, Laurie sent Lohn two emails concerning Trapp’s invoice. “These communications are improper,” said Lohn, adding he was not allowed to consider them. Lohn noted Grendell had used the word “shall” in his Sept. 16 order, referring to the approval of the master commissioner’s fees. “Judge Grendell used the word ‘shall’ three other times in his entries in exactly the same sense of a formal, resolute, unconditional command,” he said. In addition, Lohn questioned why Grendell did not write in his order the fees would be allowed, if they were found to be proper. “Everything written and not written in the entries leads to the conclusion the master commissioner fees were approved,” Lohn said, adding Trapp interpreted Grendell’s order the same way he did, because she did not file a motion for approval of her fees. “She simply sent an invoice directly to the court,” he added. “Right or wrong, my interpretation of the Sept. 16 entry is a substantive matter. The recused judge has no business commenting on this issue or any aspect of my decision, publicly or privately, directly or by proxy,” Lohn said, citing to the rules of judicial conduct. Even if Grendell were correct and Lohn had “left an issue on the table,” Lohn said he would be violating two court orders and disrespecting the 11th District Court of Appeals jurisdiction if he decided the reasonableness of Trapp’s fees. “If the judge feels there are matters remaining to be adjudicated, he should issue a second recusal and notify the chief justice. In fact, I urge him to do so,” Lohn said. Filed concurrently with Lohn’s Feb. 15 notice was an eight-page affidavit from Laurie, in which she admitted to calling Lohn on Feb. 7. However, she denied ever requesting in the call or in any of her subsequent emails that Lohn schedule a hearing concerning the fees. “We had a very pleasant conversation that lasted approximately 12 minutes,” Laurie said. “Judge Lohn kindly explained that he had understood the statement in Judge Grendell’s (Sept. 16) order . . . to mean that Judge Grendell had (approved the fees), as stated in Judge Lohn’s Feb. 2, 2017, journal entry,” she said. She said she asked Lohn for his email address and he provided it. After conferring with Grendell, Laurie said she sent the Feb. 9 emails to Lohn, advising him Grendell did not pre-approve the fee amounts and that he needed to review them. “Judge Lohn did not advise me that following up via email, as we discussed in our phone conversation, would be considered ‘ex parte’ communication,” said Laurie. In her Feb. 16 email reply to the Maple Leaf, Laurie also explained her ability to properly administer invoices requires communication with the judge who presides over a case.